On the rare occasion that I work from home, I always like to set aside 30 minutes to make a nice lunch. And with all the different ingredients in my fridge, a chef salad sounded perfect! The wonderful thing about a chef salad is any ingredients can be added. I usually just see what I have left in the refrigerator and throw something together. 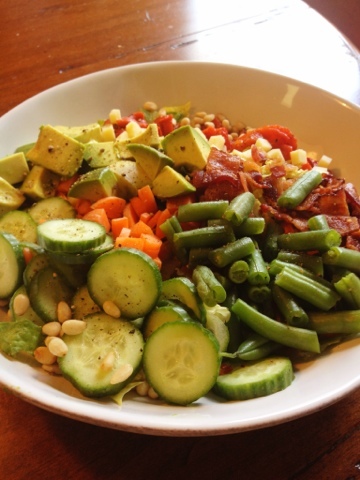 On this salad I added romaine lettuce, cucumber, lightly steamed green beans, carrots, pine nuts, roasted red peppers, bacon, avocado and manchego cheese. Top with your favorite dressing and voila! You have yourself a healthy lunch that tastes MUCH better than a cheeseburger from McDonalds.